On The Buses was a popular comedy series which ran from 1969 to 1975. Former Variety performer Reg Varney played chirpy Stan Butler, bus driver, who, with his equally chirpy conductor, Jack, was the bane of Inspector 'Blakey' Blake's life. With Stan and Jack on the No.11, laughter is never far away...etc.. etc.. One day, a new Nurse takes up her post at the depot, and Stan offers her the spare room in the house he shares with Mum, Sister and Brother-in-Law. At home, the Brother-in-Law takes a fancy to her....with hilarious results. Quite honestly, this is pants; what passed for humour in the 1970s is sexist by today's standards. But if you really want to find out more, then go to http://www.televisionheaven.co.uk/overview9.htm#buses These scans come from the episode The New Nurse, first broadcast in 1971. Nurse Mary was played by Hal Dyer. 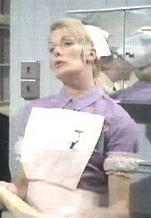 Nurse Mary played by Hal Dyer, 'On the Buses', UK 1971.